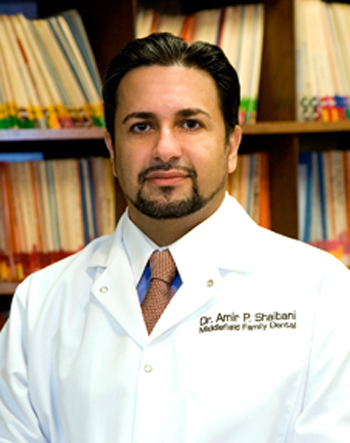 Dr. Amir P. Shaibani is a life long resident of North Eastern Ohio. He began working in Middlefield, Ohio in 2000, and he established his practice (Middlefield Family Dental) in 2001. Dr. Shaibani is a graduate of Case Western Reserve University School of Dental Medicine in Cleveland, Ohio. He completed a General Practice Residency at Western Reserve Care Systems/ Forum Health Hospitals with concentration in dental surgery. His undergraduate degree is a Bachelor of Arts in Biology also from Case Western Reserve University. Dr. Shaibani is originally from Warren, Ohio. Dr. Shaibani believes that optimum dental health and care are a combination of compassion, skill, and a continuous study and implementation of new methods, techniques and equipment. Dr. Shaibani and his team pursue continuing education in excess of Ohio State requirements and employ the latest technological advancements and state of the art procedures allowing for optimum care of their patients. Dr. Shaibani is a member of the American Dental Association, the Ohio Dental Association, and the Northeastern Ohio Dental Society. Dr. Shaibani is certified in Invisalign orthodontics, and advanced Cerec-Cad Cam technology. On a personal note, Dr. Shaibani is an accomplished artist, creating art in painting, sculpture, precious metals, and glass. He is an avid reader and student of history, science, art, and philosophy.